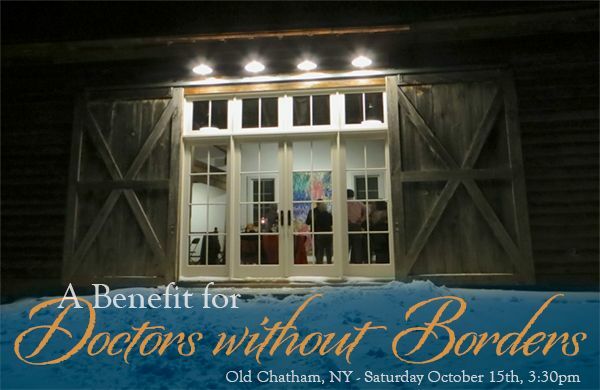 Patricia and I worked closely with our friends Andy and Lois to coordinate a benefit event to raise money for Doctors without Borders, a cause I fully support. Andy and Lois offered to host the event in their beautiful, transformed barn complete with glass doors, intimate lighting and a Steinway piano. Accomplished singers volunteered to perform in the spirit of supporting the event and John Mathews, our own Doctor without Borders will attend to share his story. John is an anesthesiologist at Columbia Memorial Hospital in Hudson and has been on a number of missions in places you don't want to go--and is scheduled for another deployment right after this event. Ron Raines, Broadway leading man (Tony Nominee, FOLLIES) and soloist for many world-class orchestras, including Boston Pops, BBC Orchestra and Jerusalem Symphony, will sing musical theatre classics accompanied by Don Pippin, Tony-winning conductor (MAME). The concert will be emceed by Jim Wann, lead composer and leading man of Broadway's Tony-nominated (Best Musical) PUMP BOYS AND DINETTES. Jim will also sing, accompanied by John Lewis (Broadway's BIG RIVER). Two acclaimed singers of American Songbook standards and contemporary musical theatre, Mikki Sodergren and Michael Malakiel--each a winner of the prestigious Gold Medal at Savannah's American Traditions Competition--will perform solo and in duets. Watch Michael Maliakel performing 'Deli'.